Thousands of scans affecting 26,000 patients were reviewed – of those, 11 people’s cancer diagnoses were delayed, it was found. THE MINISTER FOR Health Simon Harris has said that he’s “deeply saddened” by the impact misread radiology scans had on families in the Kerry area. Yesterday, a review of all 46,000 radiology scans examined by a single consultant radiologist between March 2016 and July 2017 was published. It found that of the 26,754 individual patients, 11 individuals had their cancer diagnosis delayed. Of those 11 people, four have since died. “On a human level and on a personal level, I’m extraordinarily saddened to what’s happened to the 11 families impacted, and particularly the four people who have passed away and my thoughts are with those families,” Harris told reporters today. The Dáil was told today that a 71-year-old man, whose family claim he is among those who has had his cancer diagnosis delayed, “doesn’t have long left”. Sinn Féin’s Pearse Doherty told the Dáil that the 71-year-old had three x-rays where his cancer wasn’t picked up, and his symptoms persisted. Doherty said that a GP referred him for another scan, where it was discovered that he was misdiagnosed. “[By this time], the missed lung cancer had spread and wrapped around the main artery of his heart. He went through horrific treatment, his wife has said, and he’s only a short time left. 44,831 were given a Score 1. There was agreement with the original report or a minor abnormality of no ongoing clinical significance. 105 scans were given a Score 3. This required immediate communication to a Clinical Subgroup as the previously unreported finding was of potential or definitive significant clinical concern. The percentage of ‘Score 1′ ratings out of the total of 46,234 scans reviewed is approximately 97%. When you include Score 2 in that, it represents around 99.8%. 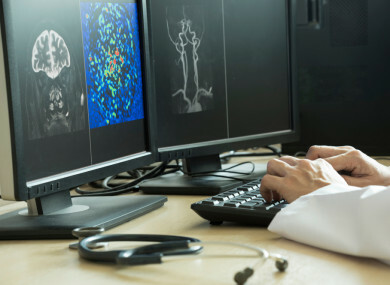 According to a 2013 report on the factors contributing to diagnostic errors in radiology, the real-time errors in daily radiology practice are an average of 3% – 5%. A total of 422 patients were identified to be recalled following the Kerry consultant review. After repeat scans, 59 patients required a follow-up or investigation and 10 were sent to other hospitals for specialist care. Of those 69 patients which required follow-up, that represents 0.26% of the total patients affected, and the 11 patients who had their cancer diagnosis delayed represents 0.04%. Simon Harris commented on the scale of the investigation to reporters today. “And I think when we talk about the Kerry situation we do need to recognise that this was a really large review. Over 46,000 x-rays were reviewed, a very comprehensive body of work, and of that 46,000 around 422 needed further examination and of that, sadly there were 11 adverse incidents. Now that’s horrific for the 11 impacted, absolutely it is, but I do think we need to acknowledge that 46,000 were examined. That’s what we want the health service to do, when something does go wrong, acknowledge it went wrong, take every step to fix it, apologise and mean it, and make sure that lessons are learnt. Tánaiste Simon Coveney told the Dáil today that the report had been published in the past 48 hours and that the 16 recommendations in the report were already being implemented. Any families that still have questions and need answers, they need to get the full cooperation of the hospital involved. He said that the review was triggered after complaints were made about the consultant. He said that the government was trying to ensure that the response was “patient-centred”. Doherty asserted that forcing families to go through the courts system for compensation wasn’t “patient-centered”. The Faculty of Radiologists, RCSI (Royal College of Surgeons in Ireland) released a response today. Over 2 million radiologic examinations are performed in HSE-run Irish hospitals every year. The vast majority of these are performed to a high standard and reported promptly and accurately. Unfortunately, no test is 100% accurate and errors may occur both in the technical performance and in the reporting of a radiologic examination. Examinations are reported by humans and humans make errors. Whilst individual errors are regrettable with potentially profound implications for the patient, errors do not always imply negligence or malpractice. He said that full scale reviews, such as the one performed in Kerry, “are challenging to organise, time-consuming and can result in significant distress to both patients and staff involved”. However, in certain circumstances it is necessary to perform them. The Faculty of Radiologists extends sincere sympathy to all of the patients and their relatives affected by this review. We also acknowledge the distress caused to University Hospital Kerry staff by this review. The Faculty of Radiologists welcomed the recommendations of this report, and said that if they are implemented they will lead to more robust internal processes within UHK and other hospitals. All Irish public radiology departments are under pressure as resources of staff and equipment are not adequate for the demands placed upon them. These problems are most acute in small departments such as University Hospital Kerry, where burdens such as on-call duty are spread between a small number of consultants. These departments frequently have difficulty in recruiting consultant radiologists and may be over-reliant on locum support and outsourcing. Email “'His family believes that if his cancer was detected in any of the 3 x-rays, his prognosis wouldn't be terminal'”. Feedback on “'His family believes that if his cancer was detected in any of the 3 x-rays, his prognosis wouldn't be terminal'”.